Utilizing and burning stored body fat to produce energy throughout your day can aid in a more productive lifestyle, but it can also benefit your overall health and wellness. How can you convince your body to pull from its own stored fat, though? How can you get out of your daily slump? Intermittent fasting is a term used to describe a variety of eating patterns in which no or few calories are consumed for time periods that can range from 12 hours to several days, on a recurring basis. Most research states the point of negative energy balance at which liver glycogen stores are depleted and fatty acids are mobilized is typically beyond 12 hours after food intake ends. This is why so many will recommend a 18:6 hour ratio, with 18 hours being fasting and 6 being calorie intake hours. While simply living the 18:6 hour ratio may work well, you can take it a step further and follow the eTRP (early time-restricted feeding) schedule with your meals. This plan includes eating early in the day to be in alignment with circadian rhythms in metabolism. A recent study followed pre-diabetic men during their 18:6 ratio of intermittent fasting, in which dinner always fell before 3:00pm. While weight loss was achieved, eTRF also improved insulin sensitivity, β cell responsiveness, blood pressure, oxidative stress, and appetite. Throughout a fast, your body initiates important cellular repair processes and changes hormone levels to make stored body fat more accessible. Blood levels of insulin drop significantly, which signals fat burning. Muscles grow and the blood levels of growth hormone can increase as much as 5-fold. The body is believed to be able to fight off illness faster and work toward cell repair, which leads to a longer life. There is an increase in the growth of new nerve cells, which should have numerous benefits for brain function (including preventing Alzheimers and Parkinson’s). The hours spent fasting provide the body needed time for cells to remove waste products. The enhanced hormone functioning that takes place during an intermittent fast triggers weight loss. Short-term fasting increases your metabolic rate by 3.6-14%, helping you burn even more calories, which aids in a quick weight loss. But the key is balance, and you must understand that any weight that is shed can be easily gained if you you do not follow through with lifestyle changes. Something to note is that not only does weight loss occur, but intermittent fasting helps to diminish the belly fat that is linked to a multitude of health dangers. Stop eating at night at a specific time – such as 7pm, at least 2-3 hours before bedtime. Remember that if you are sick or feeling off in any way, listen to your body and give yourself some slack on the day’s fasting goals. 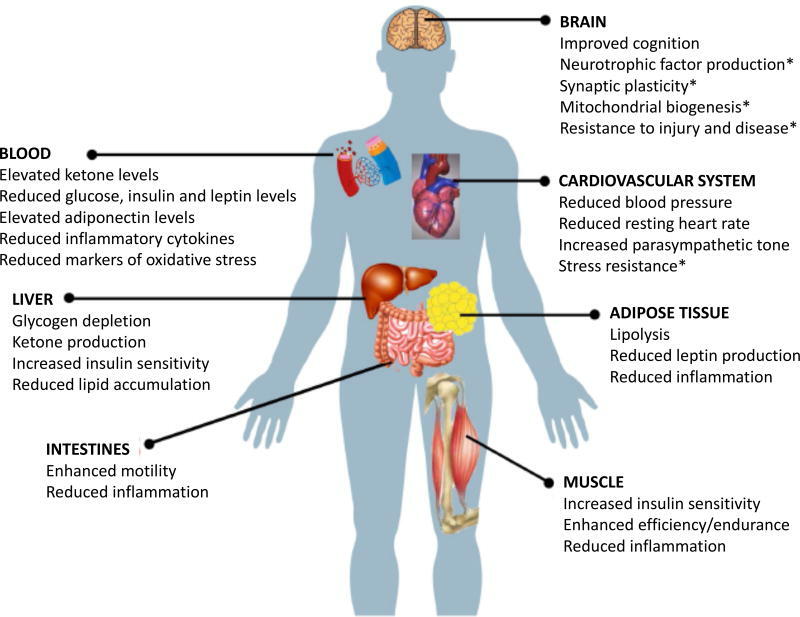 Examples of functional effects and major cellular and molecular responses of various organ systems to intermittent fasting. Profiles of circulating glucose and ketone levels over 48 hours in individuals with a typical American eating pattern or two different IF eating patterns. (a) In individuals who consume three meals plus snacks every day the metabolic switch is never ‘flipped’ and their ketone levels remain very low, and the area under the curve for glucose levels is high compared to individuals on an IF eating pattern. (b) In this example, the person fasted completely on the first day and then at three separate meals on the subsequent day. On the fasting day ketones are progressively elevated and glucose levels remain low, whereas on the eating day ketones remain low and glucose levels are elevated during and for several hours following meal consumption. (c) In this example the person consumes all of their food within a 6-hour time window every day. 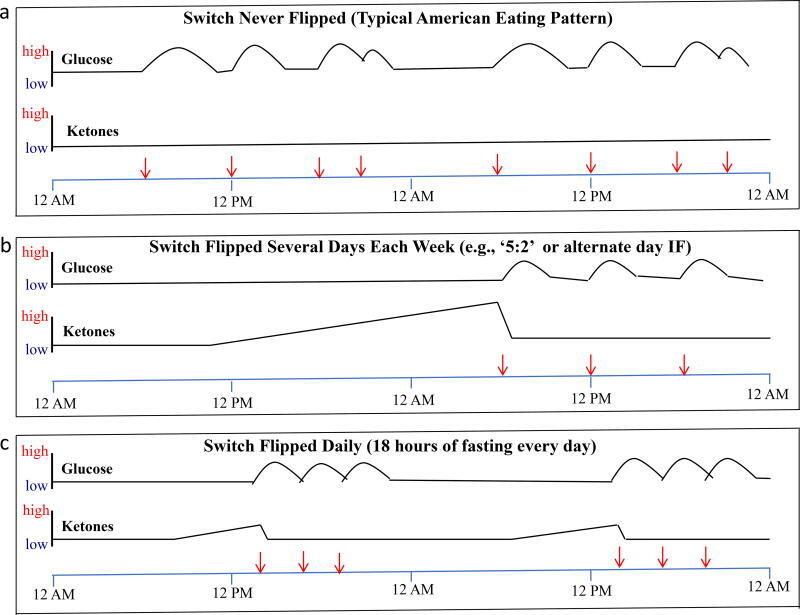 Thus, the metabolic switch is flipped on following 12 hours of fasting and remains on for approximately six hours each day, until food is consumed after approximately 18 hours of fasting. Digestive Enzymes: Should You Supplement? Let me back up for a moment and give you a bit more background information. Our intestines receive bile and enzymes that work together to break food down to be passed from the body. These enzymes also aid in feeding the body the nutrients from the foods consumed. When everything works as it should, there is no bloating or gas, and bowel movements are regular, easy, and normal. This is typical within the few humans who truly eat a whole foods diet and lead lives unexposed to toxins and stress. As you can understand, that is a very slim margin of people, if any. Sadly, most children and adults in our society consume processed foods, foods containing pesticides and carcinogens, toxins like dyes that are not even food, and more sugar – in too many forms to name – than could be imagined. It’s easy to find the research that links these bad habits, along side of the environmental toxins known to affect the gut, to the decrease seen in bile and pancreatic enzymes within the intestines. The body cannot properly break them down because they are not meant to be there. The bile is blocked from the intestines, preventing the enzymes to reach and aid in pushing these items from the body – or releasing the nutrients properly throughout the body. This is when constipation and mushy poop start occurring; stomach aches, bloating, gas, heartburn, nausea, discomfort, low energy, and allergy-like reactions, as well. It’s no wonder kids are mean, unfocused, and pretty cranky today. (As are most adults when you really pay attention.) Their guts need mending. While the true answer is to heal the gut and consume 100% organic whole foods, while also leading a stress-free life outside of toxins, it might be easier said than done. I do truly encourage you to eliminate wheat (all gluten) and dairy, and consider a full elimination diet – even with your children. While doing so, digestive enzymes can still be used to aid in healing the gut. Digestive enzyme supplementation is all the rage right now, and I am completely in favor of it being added to your vitamin shelf (It can’t go without mentioning that it needs to be a high-quality version). However, it is not a cure all, and should not be depended upon with every meal, every day. It doesn’t make eating fast food okay. The gut should be healthy, and digestive enzymes should be used when foods such as gluten and dairy are consumed to help the body digest them without triggering inflammation. Irritation to the gut from stress, pollution, pesticides, and processed foods can cause the tiny hair-like structures along the sides of the intestines to become clogged, throwing off the balance of bacteria, stomach acid, and forcing the toxins back through the liver for detoxing. The liver can become congested and trigger a slower and thicker bile and enzyme production. With less of bile and enzymes, it becomes harder and harder for the intestines to do their job well. Taking a digestive enzyme supplies the body with the needed enzymes to break these items down. Not only do digestive enzymes aid in the digestion process, but they also allow the body to absorb more nutrients. They break food into amino acids, fatty acids, cholesterol (the good kind), simple sugars, and nucleic acids. They also may aid in easing or eliminating chronic symptoms from digestive disorders, which are of course commonly linked to diagnoses such as Gluten Intolerance, IBS, Lactose Intolerance, ADHD, Autism, and even schizophrenia. In a world where food is more fillers and less nutrients, and a society with sky-rocketing chronic illnesses and autoimmune diseases, a little help through enzyme supplementation provides ample benefits. Digestive enzymes will take the stress off of the stomach, pancreas, liver, gallbladder and small intestine when hard-to-digest foods are consumed, so why not add them to your health arsenal? While you can find over 40 enzymes currently available; you want to look for a high-quality, broad-spectrum enzyme supplement. This covers the bases and works well with those wanting help in basic digestion and nutrient absorption. It’s time to stop blaming the child for the chronic issues that he cannot help. It’s time to dig deeper than a simple diagnosis to something chronically plaguing your child. It’s time to find the patterns, connect the dots, and look at the bigger picture. It’s time to stop making excuses, and follow your instincts. Calories do not equal nutrition. Just because your child is eating meals does not make them healthy meals. Store bought, shelved cereal, bread, waffles, granola bars, sandwiches, cookies, crackers, French fries, the list goes on and on… these are not actually foods. They are processed and filled with chemicals, artificial items, and absolutely nothing that benefits the body. They are not just a filler though… they are harming the body. Even the perfect gut should not be consuming these items. What happens when these chemicals, toxins, and other microbes overgrow in the digestive tract? They transform the gut from a source of nourishment to a source of toxicity. The food that comes along gets digested by this abnormal mass of bacteria, they convert it into hundreds of toxins that flow into the blood stream. These toxins travel through the body affecting different individuals in different ways. If the brain of the child is clogged with toxicity, all of this sensory information cannot be processed properly. This can symptomize as ADHD, Sensory Processing Disorder, just an emotional or overly strong-willed child. You may see eczema, bumps on the arms, or other rashes. Your child may wet the bed, sleep horribly, or be overly tired. She may have a swollen gut, constipation or loose stool issues. The list of possibilities is pretty long, but it all connects to the health of the gut. No food dyes – these should NEVER be consumed. There will be a nasty die-off period of detoxing from the sugars and chemicals that the body has come to rely on. A child may even seem worse for a brief amount of time before you see improvement. The hardest part comes after this. After surviving a toxic detox from a child. This is when you will be able to start figuring out which REAL foods affect your child. You can opt for an IgG blood test, or you can follow a true elimination diet (I highly recommend the GAPS diet). 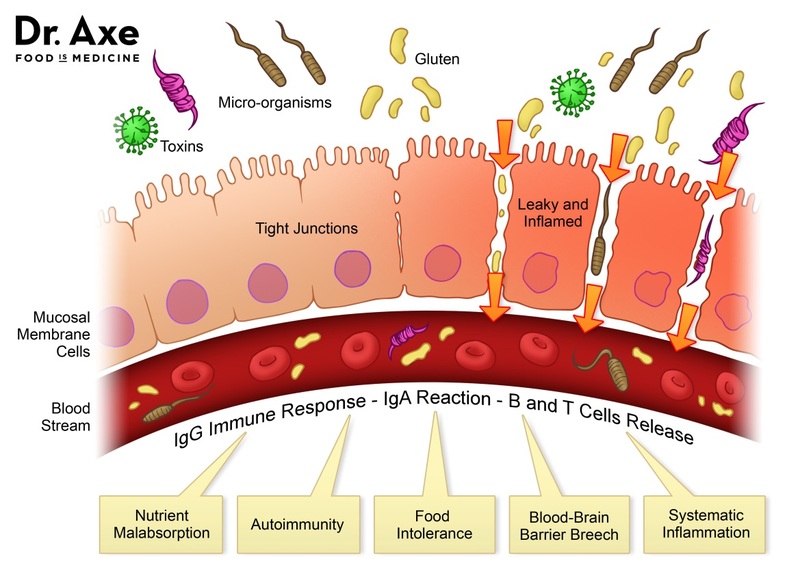 Once you have identified which foods trigger an inflammation of the gut (bringing back symptoms you have seen before or new ones), you will then begin to create a lifestyle full of all the foods your child responds well to! Our kids are overfed and undernourished. I suggest reading The Gut and Psychology Syndrome by Natasha Campbell-McBride. Through her research, she has determined a distinct correlation between unhealthy intestinal flora, poor digestion and toxicity from chemicals created by undigested foods, which can severely affect brain chemistry. Note: Even if you were told your child was born with one these conditions, or that he was genetically predisposed, remember that in utero, a fetus is exposed to the gut flora of the mother. Those bacteria become the foundation to his own gut health, which can be the very reason a doctor is telling you his ‘problems’ were inherited. This is a list of outward signs that the gut is in distress. While there are several other possible signs, these are the most commonly seen and easy to relate to. 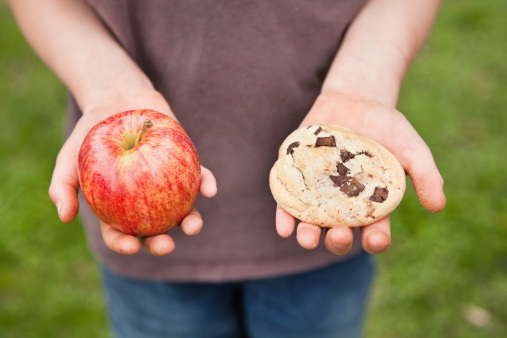 While every child is different, and how you will heal your child’s gut will vary from the next family, it is possible to alter the diet, eliminating the processed foods, dyes, and artificial sugars, and remove trigger foods. The key is figuring out what your child’s trigger foods are. If anything on this list jumps out at you, please look into closely following an elimination diet. Sporadic Emotions: High highs and low lows; sudden tantrums or more extreme tantrums than normal. Research shows that essential fatty acids (specifically Omega3) aid the body in balancing emotions and keeping a stable feeling of contentment or happiness. The body is not able to create essential fatty acids on its own, so you have to get them from what you eat. There are two forms of EFAs (omega-3 and omega-6), and they are found in the membranes of every cell in the body. Most infants (and mothers) will experience this with breastfeeding, and almost everyone assumes it is just normal. They use a natural yeast killer or take a prescription (which is then a double-headed sword! An unhealthy gut being fed an antibiotic!) and continue on without a second thought. The truth is that the yeast is a sign of an unhealthy gut. Hyperactivity is related to the brains ability to process information and remain calm at the same time. Children with hyperactivity tend to have poor intestinal flora and digestion. Put down the prescription and pick up the GAPS book. A prescription is going to mask the symptoms while worsening the underlying issue. Fat soluble vitamins such as A, D, E and K are linked to keeping the skin moist. But a diet rich in sugars and carbohydrates, processed/refined food, caffeine, alcohol, rancid oils and fats leads to skin irritations. The gut is directly linked to the skin; heal the gut. Heal the skin. While both anxiety and depression are thought to be neurological illnesses, the gut is linked directly to the brain. Studies have shown that inflammation may be involved in the development of depression. Depression is frequently associated with gastrointestinal inflammations and autoimmune diseases, all which can be treated through diet and gut repair. B12 deficiency is linked to speech delays. While increasing the natural sources (organic chicken and beef, wild caught fish) have your child tested before supplementing. As speech is processed in the brain, the ‘wiring’ may not correctly connect due to an unhealthy gut. While sugary foods, or a bottle of sugary milk at bedtime can cause cavities, I am talking about chronic cavities. Dr. Weston A. Price, a dentist known for his theories on the relationship between teeth and nutrition, found that cavities resulted from a deficiency in proper minerals, and also a deficiency in fat soluble vitamins that are needed to absorb and assimilate the minerals. When we eat foods that aren’t nutrient dense, our bodies are hungry. The body becomes starved for good nutrition and that’s why you won’t feel satisfied when eating highly processed foods and/or foods devoid of nutrients. Our bodies were meant to feel satisfied with a balance of all foods. It is easy to blame childhood colds on school, playdates, or surrounding environments, but the truth is that healthy children don’t get sick. A child with a healthy gut has the proper bacteria to increase immunity and is less susceptible to other children’s germs. There’s something to be said about serving a homemade bowl of Grandma’s chicken soup to help you feel better. Chances are that soup consisted of a bone broth simmered for days with local, fresh raised chicken or beef bones. This explains why it actually made people feel better. Research shows that iron and vitamin D deficiency are both common in children without showing obvious signs, but can be linked to many illnesses and chronic problems. These levels should be tested annually. The journey to healing your gut is not an overnight, one-size-fits-all solution where the same steps work for every individual. Truly healing your gut takes knowledge, dedication, and time. Even a tiny leak can cause big problems. A healthy gut is very selective about what gets passed into your body. 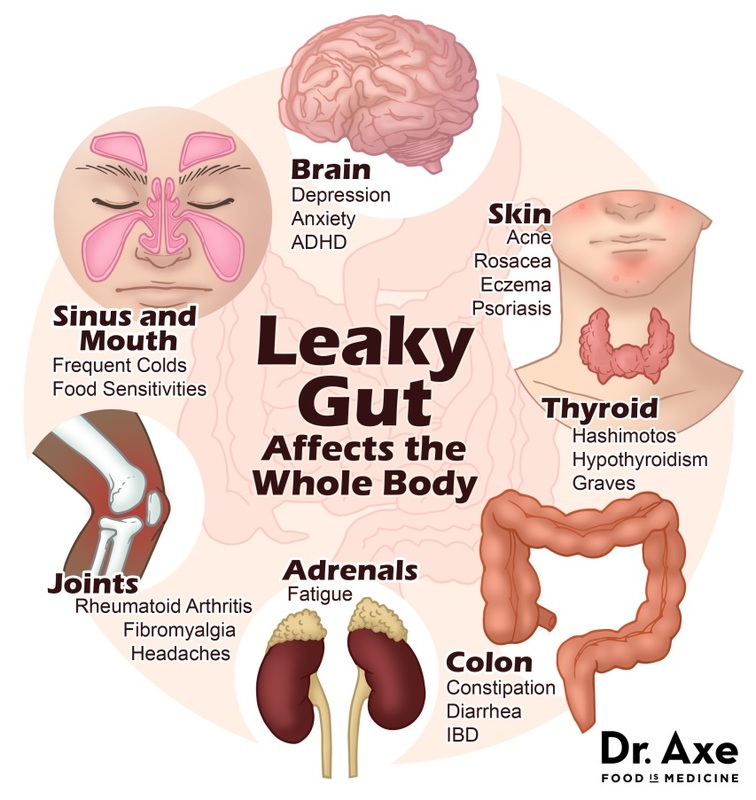 But a leaky gut can release undigested food particles, bacteria, and toxins into your bloodstream, leading to a potentially outsized immune response. If the damage to the lining of your gut is bad enough that such substances regularly leak through, it can wreak havoc on your health. You need to heal your gut, what now? Remove: In this first step you remove the offending foods and toxins from your diet that could be acting as stressors on your system. This means caffeine, alcohol, processed foods, bad fats, and any other foods you think may be causing issues, like gluten and dairy. All of these irritate the gut in some form and create an inflammatory response. Repair: The next step is to begin to repair the gut andheal the damaged intestinal lining. You do this by consuming an unprocessed diet and giving your body time to rest by providing it with substances that are known to heal the gut, like L-glutamine, omega-3 fatty acids, zinc, antioxidants (in the form of vitamins A, C, and E), quercitin, aloe vera, and turmeric. Restore: This involves the restoration of your gut’soptimal bacterial flora population. This is done with the introduction of probiotics like Lactobacillus acidophilus and Bifidobacterium lactis. A probiotic is a good bacteria and is ingested to help reinforce and maintain a healthy gastrointestinal tract and to help fight illness. In general a healthy lower intestinal tract should contain around 85% good bacteria. This helps to combat any overgrowth of bad bacteria. Unfortunately in most people these percentages are skewed and this allows for the gut health to drastically decline. The human gut is home to bad bacteria like salmonella and clostridium, which is fine as long as they are kept in order and don’t get out of control. Replace: This involves getting your bile salts, digestive enzymes, and hydrochloric acid levels to optimal levels to maintain and promote healthy digestion. This can be done by supplementing with digestive enzymes and organic salt to help make sure you have enough hydrochloric acid. Through your gut healing journey, you will begin to question everything you put in your mouth. 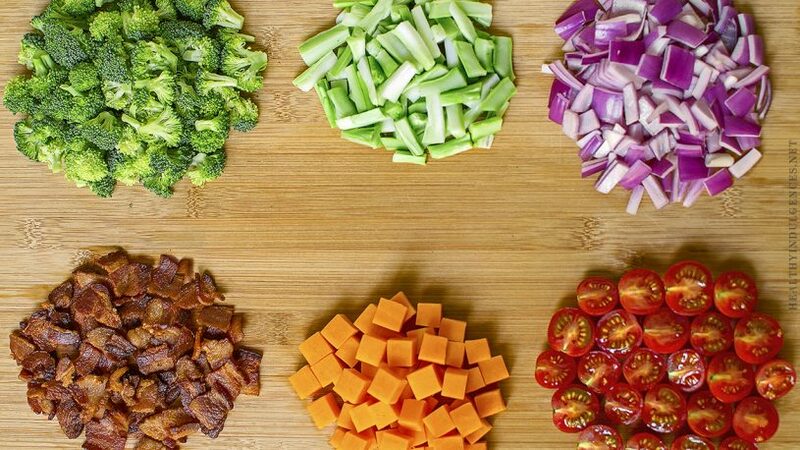 You already know that choosing unprocessed, real, whole foods are a must – but what else? What foods can you consume to help aid the healing of your gut? 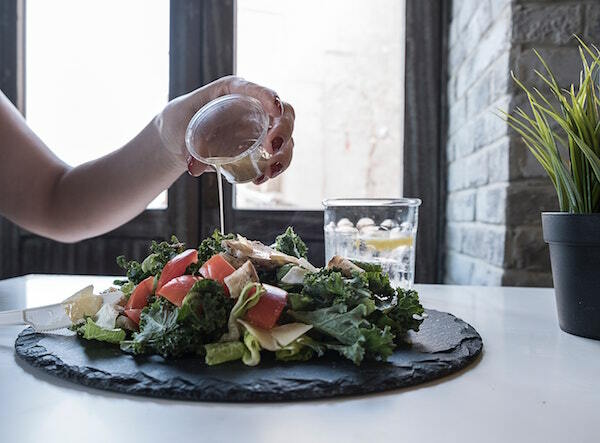 There are numerous “Leaky Gut Diets” out there (Such as the GAPS diet), and following one that works for you is a great start. But no matter what diet you choose, there are some foods that can aid the body in healing the gut. Gelatin: Bone broth already contains gelatin, so if you are consuming homemade bone broth you will not necessarily need to supplement your diet with other forms of gelatin. High quality gelatin comes from animal sources, so those who do not consume bone broth can eat foods made with gelatin to reap the benefits. Organ Meats: Organ meats are the most concentrated source of just about every nutrient, including important vitamins, minerals, healthy fats and essential amino acids. Fermented Foods: These contain organic acids that balance intestinal pH and probiotics to support the gut. Kimchi, Sauerkraut, kvass are all wonderful. Vegetables: Rich in anti-oxidants, vitamins and minerals which help control inflammation. Eating a variety of differently colored vegetables, a variety of dark green leafy vegetables, and a variety cruciferous vegetables (broccoli, cauliflower, cabbage, turnip greens, kale, Brussels sprouts, etc.) every day will provide all of the essential vitamins and minerals in a way that is easy for the body to absorb. Coconut Products: Easy to digest, coconut products are good for the gut. Grass-fed beef: Organic and pasture-raised is your best option. These are nutrient-dense and can be especially healing for the gut when the cuts include bone and fat and are slow-cooked or braised. Wild caught fish: Omega-3 fatty acids help to reduce inflammation. Ghee: Clarified butter helps balance the immune cells in your gut and can help heal your leaky gut. Turmeric: An anti-inflammatory that encourages the body to release digestive enzymes and aids the breakdown of fats and carbohydrates. Ginger: Ginger contains potent healing properties that help to reduce the irritation and inflammation caused in the intestinal lining due to leaky gut. Ginger also contains potent anti-oxidant properties that help to get rid of toxins, harmful bacteria and other microorganisms inside the intestines. This would prevent these toxins and pathogens from entering the blood stream. Lemon Water: Benefits of lemon water are to stimulate the lymphatic system, increasing both vitamin C and bioflavonoids, while also helping the digestion and elimination process. Dairy in any form: Dairy can be addictive. Caseomorphins – a cousin of morphine or heroin – are protein fragments that come from the digestion of the milk protein, casein. In addition to making you want more, casein can be highly disruptive to your body. It raises cortisol and contributes to leaky gut syndrome. Nuts: Most contain levels of phytic acid, which bind nutrients and make them unavailable (unusable), furthering malnutrition already caused by a leaky gut. They also have a high polyunsaturated fat content, which is a fragile fat that oxidizes and becomes rancid easily – exacerbating inflammation. Eggs: Containing anti-nutrients and protein inhibitors, these are frequently an allergen. Their antinutrient avidin binds to biotin and makes it unavailable to the body. They should be avoided until the gut is healed. Nightshades: Vegetables including eggplants, tomatoes, peppers, and potatoes all contain glycoalkaloids, which are compounds capable of damaging the gut barrier and furthering inflammation and a leaky gut. Excess Fruits: Until the gut is healed, the high sugar content of fruits can further damage. "I came to see Dr. Fairchild with severe back pain and sciatic pain. At 33 weeks pregnant I was not able to stand or walk for long periods of time. A basic grocery shopping run would cause me to rest all day. At 39 weeks I feel great. No more sciatic pain. My back feels strong. I'm able to walk for miles and still function with daily activities. Thank you so much. I feel so much better. Keep up the good work."